The regular beating of your heart is caused by natural electrical pulses within the body. When these pulses become irregular, the insertion of a pacemaker device can help restore a regular, healthy rhythm to the heart. 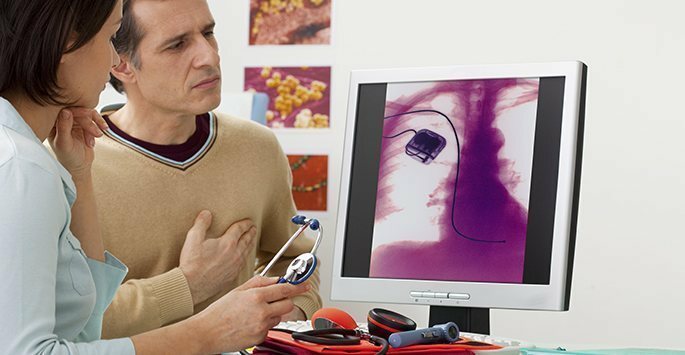 At Cardiology Consultants of Southwest Florida, our highly-trained medical team can perform pacemaker implantation as well as monitor its functionality after insertion. Cardiology Consultants of Southwest Florida is located in Fort Myers. Contact us today to schedule a consultation and find out if you are a candidate for pacemaker implantation and monitoring services. Your heart’s electrical system, known as the cardiac conduction system, stimulates your heart to beat automatically without you having to think about it. As part of the natural aging process or other factors, the pulses from the cardiac conduction system are either too slow or fail to accelerate in order to meet the body’s metabolic demands. In these cases, a pacemaker system may be necessary in order to maintain the body’s natural cardiac rhythm. During pacemaker implantation surgery, one of the two wires is carefully implanted under the skin of your chest, typically just below the collarbone. It is usually attached to the heart wall through a blood vessel while the rest of the pacemaker system remains on the outside of your body. As each body type is different, these devices can be fitted to ensure comfort and optimal efficacy. The electrode at the end of the lead delivers electrical pulses to the heart and also monitors the heart’s electrical activity then sends the information back to the pulse generator. When the heart’s rhythm is slower than the programmed limit, a gentle electrical pulse is sent through the lead to the heart, causing it to beat faster. If the heart is beating faster than the limit that has been programmed, the pulse generator will typically not send pulses in order to not compete with the heart’s natural rhythm. Pacemakers are programmed to meet the needs of the individual, and there are different types of pacemakers available depending on your cardiovascular needs. Through regularly scheduled follow up appointments with our medical team, the functionality and efficacy of your pacemaker system will be monitored. Using advanced computer technology, the settings of your pacemaker will be tested and adjusted if necessary. You will also be able to address any concerns or side effects you may be experiencing with your pacemaker. Contact Cardiology Consultants of Southwest Florida to schedule a consultation and find out if you are a candidate for our pacemaker implantation and monitoring services.